These are Misty's babies, in early-May, 1997. Here, they are approximately just between 5 and 6 weeks old - note how their tails still not fully bushy, but developing quickly! Although at this time still suckling milk from their mother, they by now very much eating solid food and drinking water, by themselves. Their mother Misty, (actually Misty 2), was one of Tiny's offspring, born in August 1995. Misty was one of a litter of five - herself Misty 2 (female), Lucia (female), Frantic (male), Pithy (male) and Little-One (male). Gradually, all of them of that particular litter have sadly died off, but some of their offspring are still very much alive today!! These are Amy's babies, in early-June, 1999. In this photo, they are approximately 7 weeks old, and in comparison with the previous picture above, you can see how quickly they develop - particularly their bushy tails! Amy is shown elsewhere on the Chipmunk pages of this site. 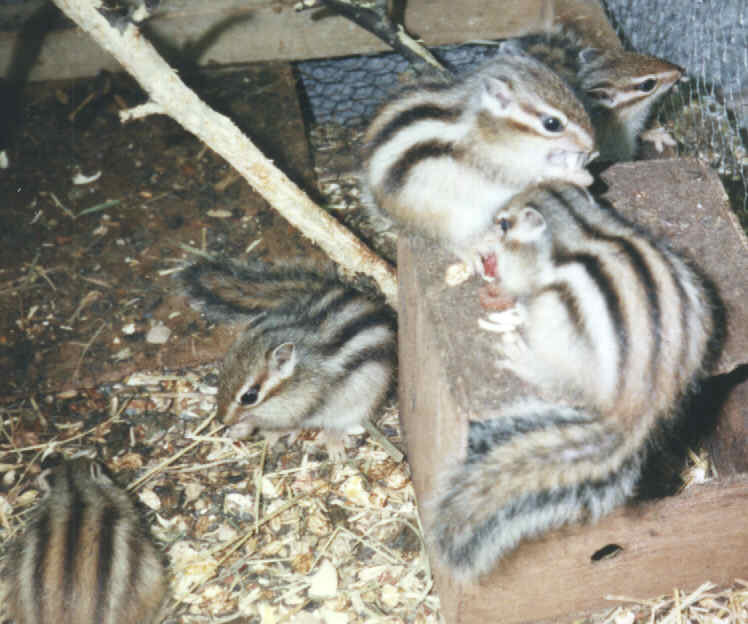 She was a very tame little chipmunk, one of the young born to Jessy - a female of 1995. All four of these babies are still alive and well today, I did not part with them - I still have them myself. They are sweet!! 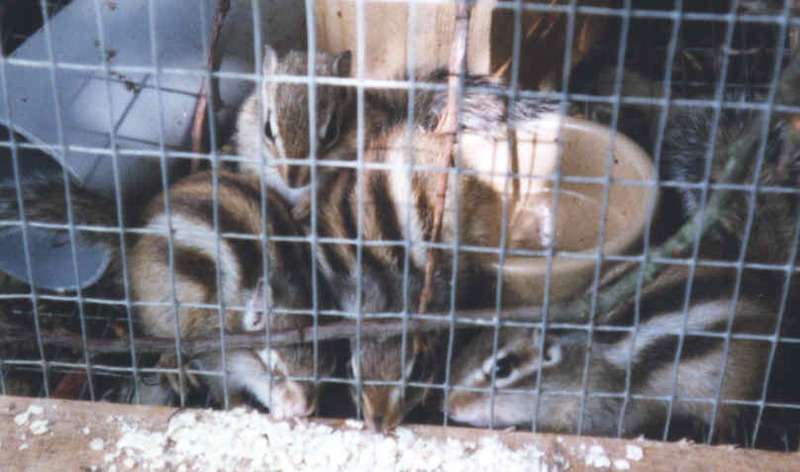 These are Sonia's babies, in early-May, 1999. Sonia was another of Jessy's offspring, born in August, 1997 - but, sadly, Sonia was a short-lived chipmunk. She contracted a severe bowel-disorder, and died, soon after this photo was taken. Sonia is in the far-left of this photo, and her babies here are only 3 weeks old! Their eyes still unopened, and still totally dependent on their mother's milk and warmth, even though they are already furred. All of them, I could still fit in the palm of my hand! Very sweet!!! 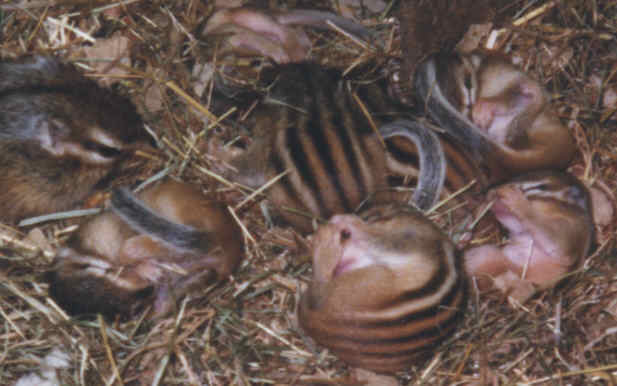 One of these babies, Lucius, is shown on Chipmunk page 1, (bottom). More baby photos coming soon - so please keep coming back!